I ordered this rug for one of my "dog suites" to keep the colorful decor with the rest of the building in-sync. The colors are a little more muted than another, similar set of rugs that I purchased for the main living areas but the rug blends in well and has done a great job so far of hiding paw prints and remnants of doggy treats. It vacuums up easily, too! I wasn't sure it would stay put on the stained concrete flooring without a rug pad but even when the dogs run and play, it stays pretty much where it's supposed to be. Overstock had it priced far less than other online competitors and it arrived at our doorstep fast! Five stars all the way around. 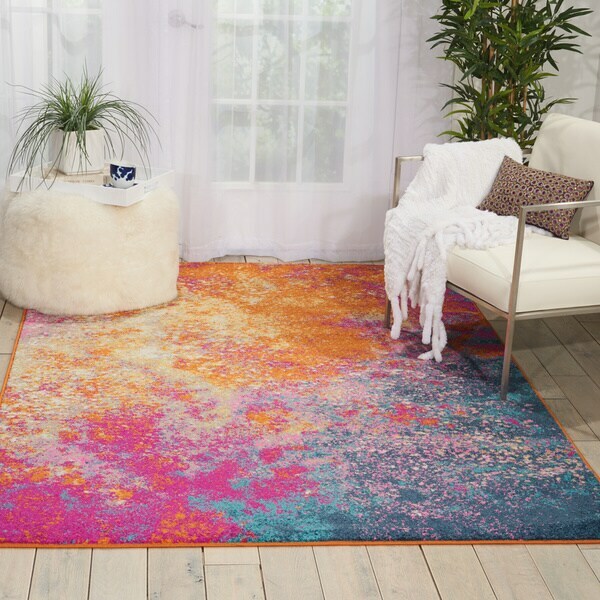 Nourison Passion Sun Area Rug - 3'9" x 5'9"
Nourison Passion Sunburst Area Rug (1'8 X2'8 ) - 1'8" x 2'8"
Rich, lush, seductive color draws you in to the plush beauty of the lovely Passion Collection. If you thrill to the pleasures of beautifying your home, you'll find Passion area rugs simply irresistible. These fantastic florals, stunning abstracts and dramatic geometric designs meld elements of classic Persian motifs with a modern sensibility. Woven of polypropylene fibers on state-of-the-art powerlooms, this collection of area rugs combines thick, comfortable pile with an easy-care approach. Advanced overdye techniques create an exciting patina effect. Live more a more colorful with Passion in your home. Dimensions 45in. x 69in. x .50in. Nourison Passion Multicolor Area Rug - 5'3" x 7'3"